“We all have incentives to manage our utility bill, but many people don’t try because they don’t know how,” says Geoff Overland, who runs IT and data-center programs for Wisconsin's statewide Focus on Energy program. "By efficiently managing our energy, we have an immediate impact on our bottom line." The Belkin Conserve Socket puts connected electronics on a simple timer. Among the major first steps is to examine doorways, windows, and insulation for leaks of cool or hot air. A building shouldn’t “breathe” unless you’ve opened a window for air. Heating and cooling are the biggest building energy hogs, so perform regular tune-ups and updates on heating and air conditioning systems, and seek Energy Star-rated equipment. 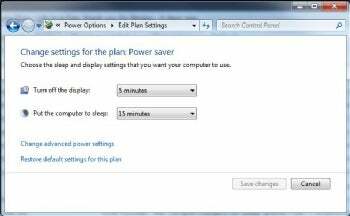 The Windows 7 OS features updated power-saving settings. “The IT workload is growing almost as fast, if not faster, than any other workload in the U.S.," Overland says. A typical computer can use 500 kilowatt-hours of electricity or more per year, Overland says. If you pay 8 cents per kilowatt-hour, that’s $40 per year to run just one computer. Multiply that by two or three if you don’t turn off the PC at night. The Kill-a-Watt spells out in dollars and carbon emissions what your electronics are consuming.